A quick and healthy sheet pan meal that’s great for lunch or dinner! 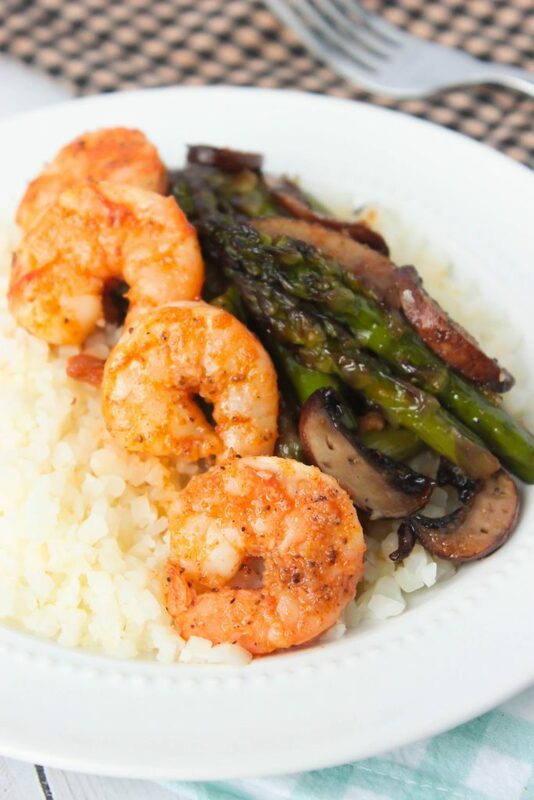 This Roasted Asparagus Mushroom Shrimp Sheet Pan Meal is perfect served as is, or spoon it over rice, cauliflower rice or mashed potatoes. This post and recipe is sponsored by Michigan Asparagus. I was compensated for my time but all words and opinions are 100% mine. Sheet pan meals are pretty high on my LOVE list and I have quite a few sheet pan meal recipes that are in constant rotation for meal planning around here. I’ve been working on sharing some of those with y’all and I’ll be sharing even more over the summer. Sheet pan meals are probably my favorite way to use fresh vegetables that we pick up every week. You might have seen a teaser of this recipe on my Instagram a while back, it’s finally time to share the recipe with y’all! I love coming up with new recipes for y’all. I have a goal to use fresh ingredients during the summer too. A few weeks ago, I posted a fantastic Asparagus Kielbasa Bow Tie Pasta recipe that I made while I was working with a huge box of fresh asparagus that Michigan Asparagus sent over! This recipe is the second recipe that I created using the asparagus that Michigan Asparagus sent to me. 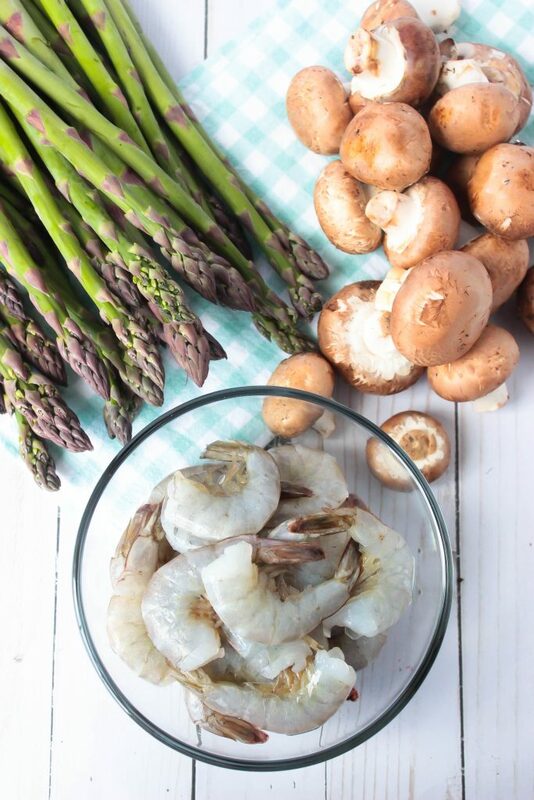 We love asparagus because it’s so great in so many of the recipes we make during the spring and summer, but we also love it because it’s a good source of potassium, fiber and vitamin B6! Sheet Pan Meals are great for 2 reasons. #1 – They are quick and simple to put together. #2. – There are all kinds of combinations that you can use to create one. 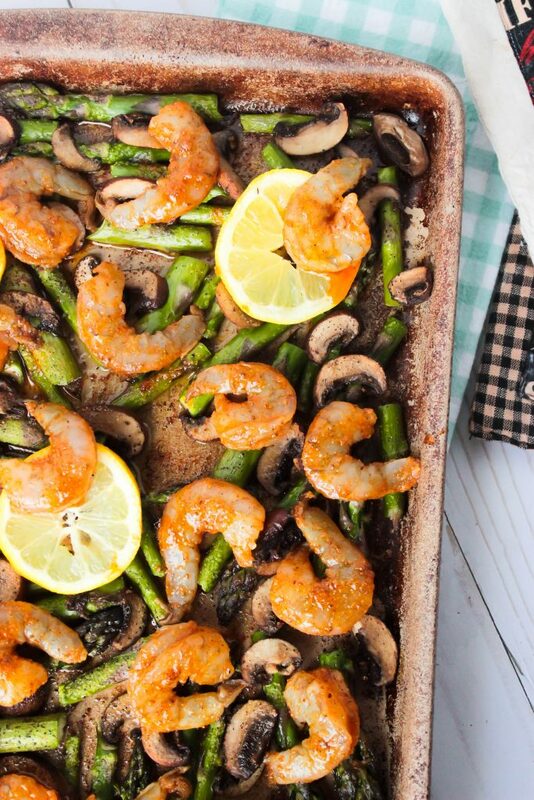 For this sheet pan meal I went with asparagus, mushrooms and shrimp. I could probably eat these three ingredients every day because I love them so much, so I can’t believe it’s taken me so long to combine all of them together for this new sheet pan meal for my recipe box. A few tests runs meant that I got to enjoy this tasty meal over and over just to make sure everything was working perfectly together. 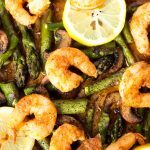 For this recipe, I used large shrimp and my bags of shrimp that I tested this recipe with contained between 23-26 large shrimp per bag. 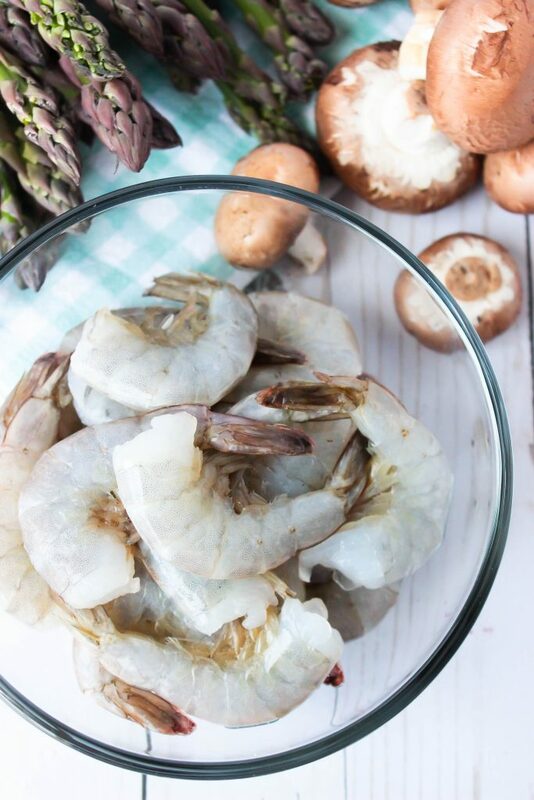 The large sized shrimp that I used were the “31-40 count” large shrimp – this means that there somewhere between 31-40 shrimp per pound in this size and this information should be on the very front of your shrimp package. Also, I removed the tails when I peeled them for this recipe but you can leave the tails on when you’re peeling them for a “fancy look”. I’ve got the whole recipe for y’all below, but here is a quick little overview of the recipe. 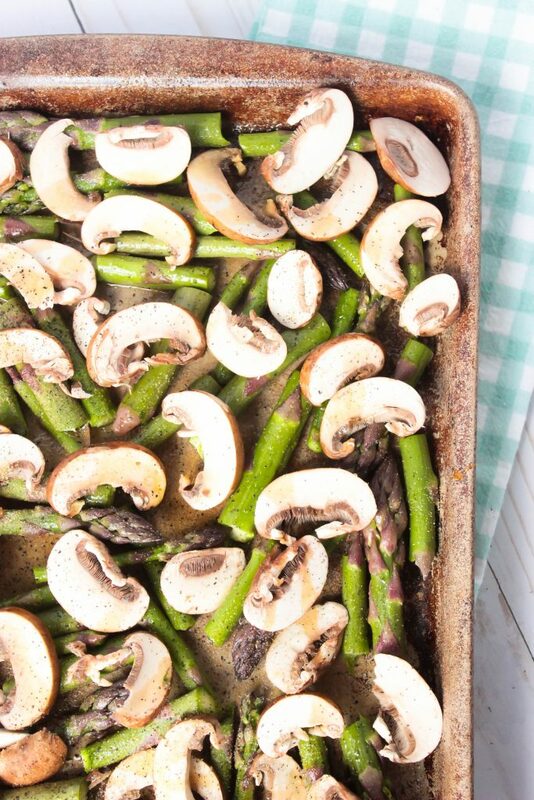 You’re going to snap the asparagus into parts (and toss the tough ends), slice up some lovely mushrooms and toss them together onto a sheet pan with a bit of seasonings and olive oil. You’re going to roast the asparagus and mushrooms first. 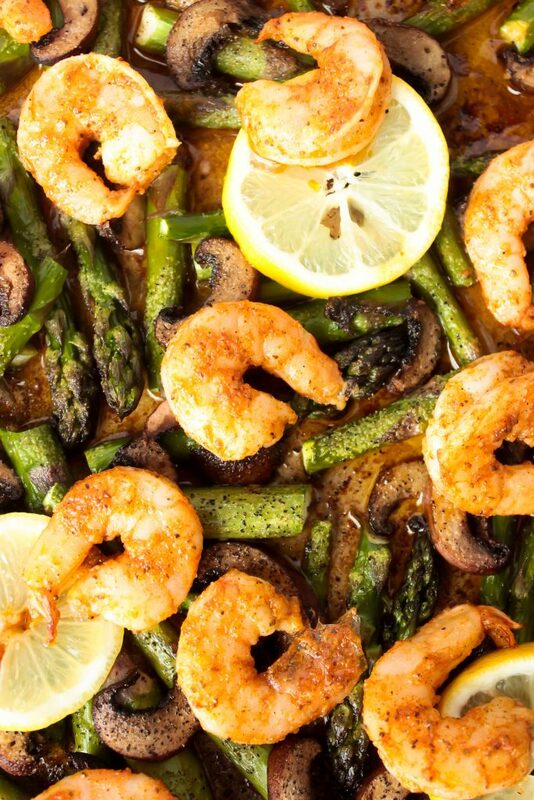 Then you’re going to toss on some marinated shrimp, a few lemon slices and a bit of lemon juice before popping the sheet pan meal back into the oven just long enough for the shrimp to cook up, which is about 5-6 minutes. I used Old Bay and garlic powder to season up the shrimp in this recipe. I wanted to note that this was tested with both 1 tablespoon of Old Bay and 1/2 a tablespoon of Old Bay. Now we loved the versions that were made with 1 tablespoon of Old Bay but I also felt like most people would probably prefer the version that was made with 1/2 tablespoon. My husband loves Old Bay so we use it a lot, which is probably why we loved the version that had more. I also love adding a few lemon slices to this sheet pan meal and the nice big squeeze of lemon juice right before the 2nd roast just to brighten the flavor up a tad! Don’t add everything to the sheet pan at once. 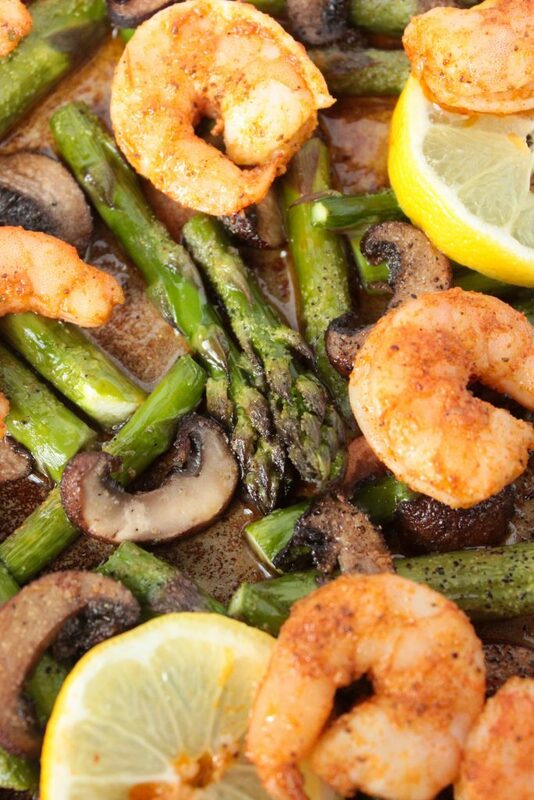 The asparagus and mushrooms need to cook longer that the shrimp. This recipe is great as is, but it’s also wonderful over rice, cauliflower rice or mashed potatoes. A quick and healthy sheet pan meal that's great for lunch or dinner! 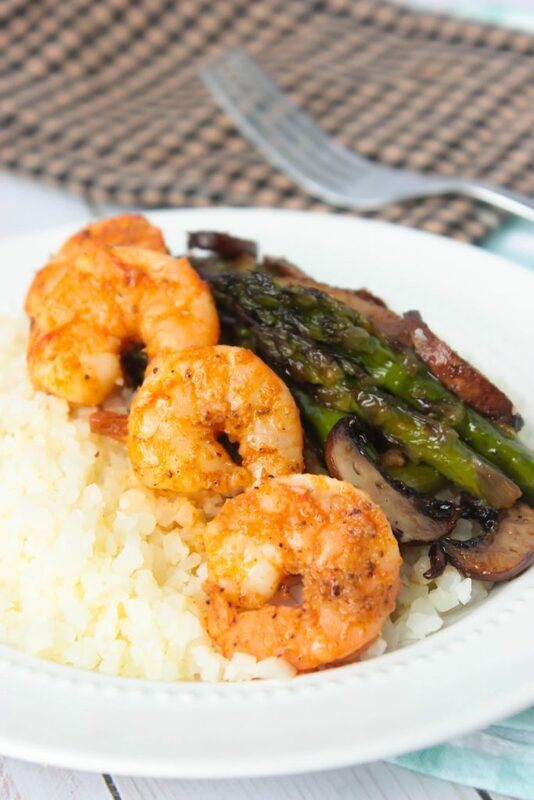 This Roasted Asparagus Mushroom Shrimp Sheet Pan Meal is perfect served as is, or just as is or spoon it over rice, cauliflower rice or mashed potatoes. Make sure the shrimp is peeled and deveined (and defrosted if needed). You can leave the tails on or remove them before cooking. I removed the tails on these. Place the shrimp on a small bowl. Sprinkle on 1/2 teaspoon garlic powder and the Old Bay. Pour in 3 tablespoons olive oil. Snap the ends off of the asparagus. You'll want to remove and throw away the hard ends that were in the ground. Just bend the asparagus a bit and snap the end, it\'ll break where it needs to. For the rest of the asparagus, snap each stem into 2-3 pieces. You can cut them if you want too. 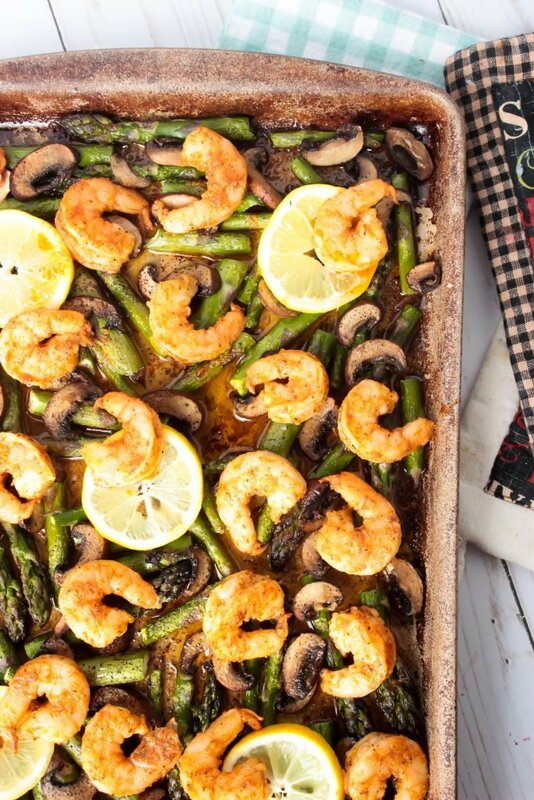 Toss the asparagus onto a rimmed sheet pan. Drizzle with 2 tablespoons olive oil. Sprinkle on 1/2 teaspoon garlic powder and a dew dashes of black pepper. Place sheet pan in the oven and roast for 15 minutes. Lay 4-5 lemon slices over the vegetables. Space the shrimp out over top of lemon slices and vegetables. Squeeze half of a lemon over the entire sheet pan meal. Roast in the oven for 5-6 minutes, until shrimp are cooked. 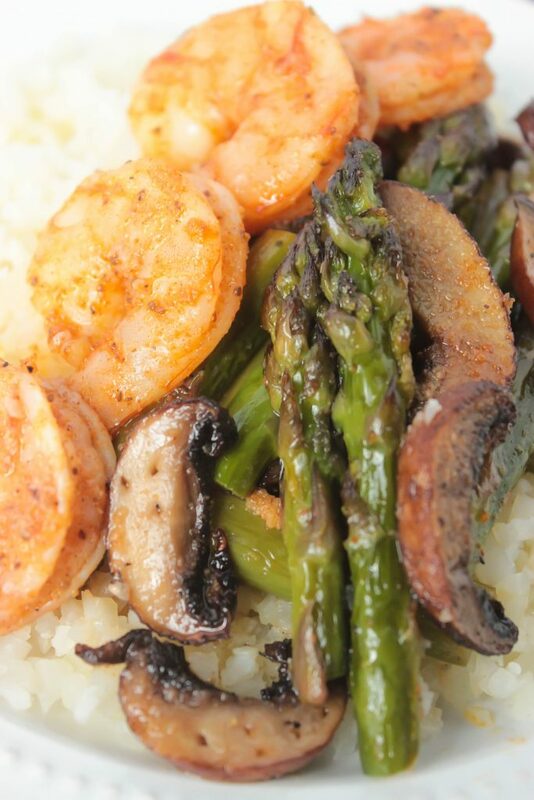 Serve over rice, cauliflower rice, or mashed potatoes. Or Just serve as is! Learn more about Michigan Asparagus by visiting them online at their website! You can also find them online on Facebook, Instagram, Twitter and Pinterest! 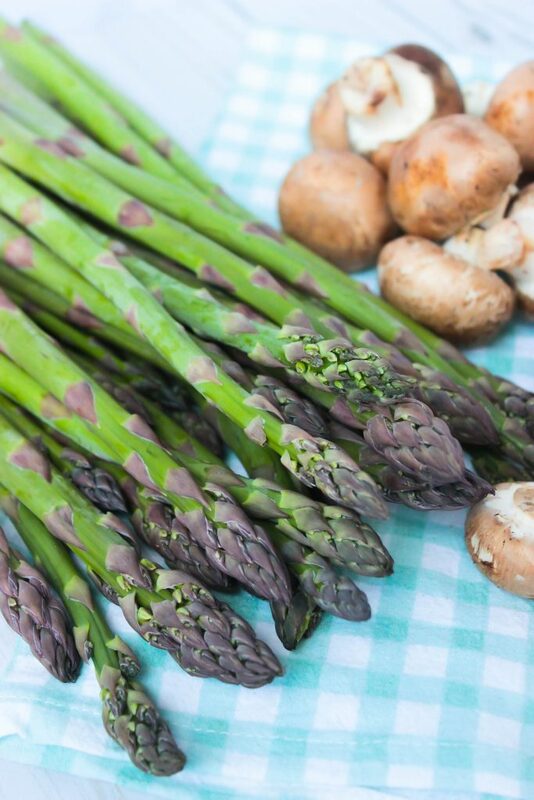 Now take a look at this amazing giveaway from Michigan Asparagus! It’s a $1000 giveaway, y’all!!! We LOVE sheetpan meals at our house! And asparagus is always a winner! Must try this soon! Sheet pans meals are the best! Love this version with shrimp and lemon! Mine is in the oven now. Can’t wait until it’s done. I also added small sea scallops with the shrimp. Along with the asparagus and mushrooms I added chunks of green bell pepper and red onion. Was yummy!!! Hi Darlene! I’m so glad that you liked this sheet pan meal! Sheet pan meals are one of my favorite things to make because they’re so easy!